The five star Kempinski Hotel Grand Arena Bansko invites you to experience a luxury stay at the most modern winter resort in the Balkans and unveil the mystery behind one of Bulgaria’s most significant cultural and historical centers. Located in the very heart of the mountain resort, Kempinski Hotel Grand Arena Bansko is ideally positioned right across the Gondola lift station and only a short walk away from the town center. It comprises Alpine-style spacious rooms and suites, the unique Kempinski The SPA as well as superb meeting and dining facilities with spectacular views of the majestic Pirin Mountain. The luxury hotel offers for accommodation in total 157 rooms and suites, including 110 Deluxe Rooms, 22 Executive Rooms, 14 Junior Suites, 7 Deluxe Suites, 3 Alpine Suites and 1 Presidential Suite. furniture and bright color schemes create a comfortable and cheerful atmosphere. Every room features a private balcony, a spacious bathroom with a separate bathtub and shower cabin, air conditioning, cable TV, a mini bar, free high speed Wi Fi, a study desk, a safe box. Executive rooms offer a direct access to Kempinski The SPA. All suites feature a separate seating area, DVD player and free coffee and tea from the mini bar. Private Jacuzzi and Sauna in the Alpine Suites. Let our chefs take you to a culinary celebration – enjoy lavish breakfasts, exclusive theme buffets at The Gallery restaurant and Mediterranean delicacies at our fine dining restaurant Come Prima. Experience traditional Japanese cuisine at the Sushi Bar & Teppanyaki Grill and warm up the winter nights with amazing live performances in Sing Sing Piano bar. (Open during the winter season). Kempinski The Spa is a journey inspired by the European cycle of the seasons. Drawing on the elemental wisdom of nature, their treatments both invoke and restore the body’s natural equilibrium. Guided by the seasonal elements of winter, spring, summer and autumn the guests achieve a perfect balance of both body and mind. Each treatment is customised for the guest’s desired outcome and delivered with products made from natural ingredients to relax and pamper the skin. The state-of-the-art Wellness area includes outdoor and indoor swimming pools, indoor and outdoor hot tubs, outdoor tennis court, 2 types of steam baths - Hammam Steam Bath and Aroma Steam Bath, 2 types of saunas-Finnish and Bio Sauna, fitness centre, solarium and a unique snow room. 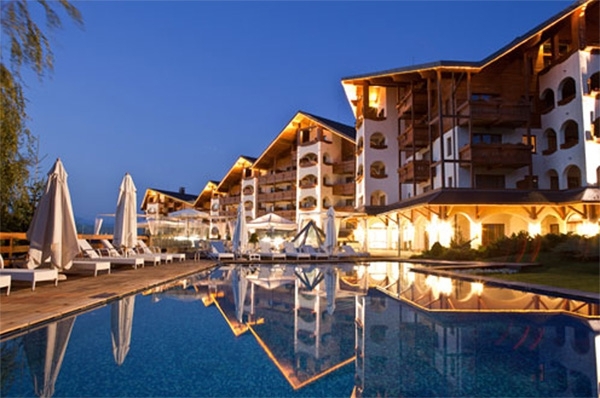 Table tennis, darts, billiards and a kids’ club are available for the guests of the Kempinski Hotel Grand Arena Bansko.